Other than the odd Colin Powell jab or his performative bashing of Mika Brzezinski several weeks ago, Donald Trump has been astonishingly tame this month. But now, it looks like the whirlwind of the past few days has finally taken its toll. My friends—our big angry boy is back. After his bizarre, wholly unsatisfying Dr. Oz interview on Thursday and his frenzied media bait-and-switch at his new D.C. hotel yesterday, it’s not all that surprising that Trump is a little amped up. Like, tweeting Hillary assassination insinuations at 2 a.m. amped up. Then, just six hours later, Trump apparently read (i.e. was told about) Robert Gates’s less-than-glowing editorial in the Wall Street Journal. So once more, Donald Trump tweeted. It probably felt good—really good. He’d forgotten just how good it felt to rail against the losers and haters who want to keep him out of office. Total morons! New York Times columnist Maureen Dowd claiming that Trump told her that he thought the violence at his rallies added “a frisson of excitement” (almost certainly not his exact words). He was already riled up, and this was the exact push he needed to let loose two weeks of holding it all in. Ah, yes. There he is, our big, sleep-deprived, delirious boy. Sorry Kellyanne Conway, but America needs these tweets. I need these tweets. 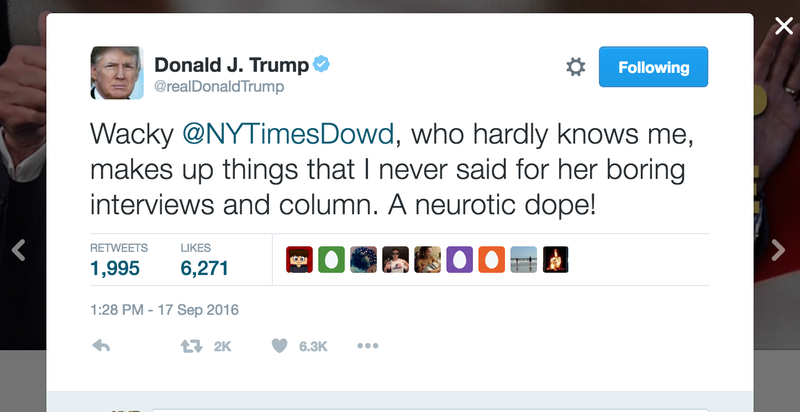 Rumor: Doctor Prescribes Donald Trump "Cheap Speed"
As for Wacky Maureen Dowd, surely she will never work in this town again. Three cheers for Mr. Trump. Donald Trump is still mad online. If you’d like to know why Donald Trump is so mad at the failing New York Times, you can find your answer here. Now, please join me as I pray for more tweets.